CURRYING EU FAVOUR? : Both Newsnight on Wednesday night and Today on Thursday morning presented what might be called pre-emptive pieces in their EU referendum coverage. ‘ Both carried items about the immigration statistics due to be published during the course of Thursday and expected to show very high levels of new arrivals beyond government targets. They can be described as ‘pre-emptive’ because – in that context – both can be seen as being clearly designed to limit the importance of claims that they said were going to be made by the Brexit side. The release of the latest statistics is certain to fuel the debate about whether leaving the EU is the only way to regain control, not just of how many people come into the country, but who precisely – a debate that’s been fuelled by an argument about who should be allowed to come into cook up the nation’s favourite dish. The voices you hear above the chopping and the sizzling are increasingly from Eastern Europe, as people born here don’t want the jobs, and tougher immigration rules means it simply costs too much to bring new chefs over from Bangladesh. We’ve been told by the British ministers to employ European Union peoples, and European Union peoples we welcome them, especially we’ve got some people who are interested to work from Romania and Bulgaria. But they never, they never stay. I don’t blame them. There is a language problem, culture problem and mainly the smell problem for them is bad, they can’t stand the curry smell. So where can I get these people from? So if JP Morgan can bring in skilled people from outside, or Big Brothers (?) can do it, why not from the small business, why is the double standard for the immigration policy? NICK ROBINSON: How does your experience, as someone running a chain of curry shops, how has your experience affect (sic) your attitude as to whether we should leave or stay in the EU? PASHA KHANDAKER: We should leave the European Unions (sic) because the European Unions (sic) are creating many pressure (sic) specially for the migration, we could have a better migration, better skilled people from abroads (sic) we have to give chance from everybody in this world who is fit for the jobs. Not for their colour, not for their geographical identity. My decision would be to stay in, because . . . we’ve been fortunate to be able to tap into the Eastern European sector of the community who are willing to do the jobs that British people aren’t willing to do. So we have economic migrants who are coming . . . coming in, working hard and fulfilling the vacancies that otherwise, right now, I think the restaurant would be closed, because we wouldn’t have stuff that we would need to do those jobs, that no one is willing to do. In other words, that brilliant EU – despite its shortcomings – was filling the gaps through its free movement directive and solved the problems caused by lazy and unwilling Britons. The Vote Leave campaign have gone so far as to claim that a vote to quit the EU would save our curry. That would only be true though if the British people wanted their politicians to relax the immigration rules to allow more people to come here from outside Europe. And the problem with that is even if you could switch off EU immigration just like that, there’s still an awful lot more people coming here than most voters say they want. Stopping or controlling immigration – that’s the main reason people who say they’re going to vote Leave give for choosing to vote that way, but even if we did leave, the debate about who we want here, how many we want here, what jobs we want people to do, would only just be beginning. In other words, the immigration concerns of ‘leave’ suporters in the referendum debate were simply ‘dog-whistle’ type responses, and the voters who wanted controlled immigration and who thought that voting ‘leave’ would solve issues like this were being simplistic in their expectations. 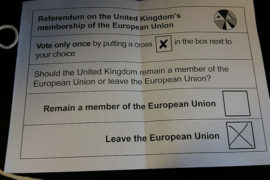 Back to the referendum now. We heard Nick earlier reporting on arguments on the Leave side about focusing on immigration, whether it’s is in danger of alienating ethnic minority voters, but does a Commonwealth heritage make you more inclined to stay in the EU, or go? Now curry has got mixed up in the EU referendum debate. Restaurateurs complain that tightened immigration rules stop them bringing in skilled chefs and other staff from South Asia. The Leave campaign is promising a vote for Brexit would change that. They say without open borders to Europe, Britain could re-forge its Commonwealth links. People who have no experience, people who even could not stand the smell of aromatic spices, how can you justify to recruit them, put them in the kitchen? The Prime Minister appeared on the Birmingham-based Sikh Channel recently arguing the case for Remain. British and minority ethnic voters could decide this referendum. According to the British election study, unlike white voters, who appear evenly split on the issue, two thirds of the BAME community wants to stay in the EU. It’s going to be largely a Remain vote for many, many Sikhs across the country. And certainly from our programming, we have been out in the Sikh community and we are getting an overwhelming sense that people want to stay as a part of the EU, because this issue really is about segregation and separation, and the Sikh community strongly believe in one world and one society. KATIE RAZZALL: As well as live news and daily prayers, the Sikh Channel is running a nightly referendum programme up to the vote. I know Vote Leave has sort of raised the idea that if we stop being a member of the EU, we will be able to close our borders, which means we will be able to not take EU migrants necessarily, and choose to bring people in from the Commonwealth instead. Is that resonating at all with you or anyone? DAVINDA BAL: I don’t think it resonates with the Sikh community very deeply, because it seems to be a bit of a shallow argument. We will replace one type of migration with another type of immigrant, or migration. That doesn’t seem to be . . . ring true, and if there is any Asian communities who are supporting that sort of stance, there may be some self-interest in that they want to see people from their home countries be preferred. Long before EU citizens set up home in the UK, immigrants from Britain’s colonies were moving here, filling jobs created after the Second World War. When Britain last held a referendum on Europe, many argued we were turning our backs on the Commonwealth and those close historical ties. The Commonwealth diaspora helped make the West Midlands the UK’s most ethnically diverse region outside London, and it’s a key battle ground for the ethnic minority vote in June. The British Nationality Act 1948 granted the subjects of the British Empire the right to live and work in the UK. 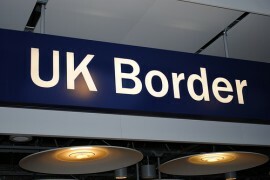 Commonwealth citizens were not, therefore, subject to immigration control but the Home Office estimate is that the net intake from January 1955 to June 1962 was about 472,000.From 1962 onwards, successively tighter immigration controls were placed on immigration from the Commonwealth. In the 1960s New Commonwealth citizens were admitted at the rate of about 75,000 per year. In practice the new immigration controls resulted in only a modest reduction in Commonwealth immigration. The average number of acceptances for settlement in the 1970s was 72,000 per year; in the 1980s and early 1990s it was about 54,000 per year. From 1998 onwards, numbers began to increase very substantially. In 1998, net Commonwealth migration leapt to 82,000 and continued to grow before peaking at 156,000 in 2004 before beginning to decline. Some historians argue that the majority of early “New Commonwealth migrants” were, in fact, British settlers and colonial officials and their descendants returning from Britain’s former colonies. AFTAB CHUGTAI: Most of the products that we sell now are manufactured outside of Europe, erm, so if we were to be able to have trade agreements with countries like China, with India, with Commonwealth countries, we would be able to be much more competitive on these goods coming over from there. We are paying into a club which we personally don’t see the benefit out of. What I would like is a fair immigration system. KATIE RAZZALL: Is, is, do you feel there is an irony in the fact that somebody like you, whose parents came over, you were immigrants originally, and now you are complaining about new immigrants? AC: No. Immigration is good for a country. If we had a system which was fair, which went all around the world, so we get the best people from around the world, so we are able to get computer programmers from India, we are able to get nurses, doctors from any of the Commonwealth countries where they speak our language, they have the same law systems and everything as us, it is much easier. So immigration isn’t the problem, it is the levels of immigration. DONALD CAMPBELL:For me, our unity is strength, and if the UK leaves Europe, the UK will be on its own. So I think it will have a devastating effect on businesses. I know a lot of people are quite emotional about this, and say, you know, we’re losing our jobs to people from abroad, but . . .
KATIE RAZZALL: For you it’s an economic argument? Other speakers, presented as visitors to the exhibition, also gave their opinions, although no on-screen information was given on them, and one wasn’t named. The first, Merisha Stevenson, had previously received free media training as part of the BBC’s ‘BAME Expert Voices’ – a programme designed to ‘increase the diversity of the experts our viewers see on BBC Television’ – and has co-presented shows on BBC West Midlands, although Newsnight chose not to indicate to its viewers in their captioning that, according to Ms Stevenson’s dedicated page on the BBC Academy’s website, she is a ‘business consultant, strategist and radio broadcaster’. CHERYL GARVEY: I feel that some of the discussions and the things that people want to change are about really taking away some of the support mechanisms for people right at the bottom of society. If it wasn’t for Europe, we wouldn’t have a number of protections around maternity leave, the 48-hour rule, and if we remove all the protections then I fear that those sorts of communities will be exploited. KR: Older voters are more likely to be for Brexit, but that’s not how Rakeem Omar sees it. RAKEEM OMAR: My grandfather, for example, he came over here in the ’60s from Jamaica, so it took around six weeks to get here, and he really fought for a better life, and coming here, really working after World War II, the country was completely dismantled, and I think helping with others to put that back together, working in the NHS, building our country back again to really build a stronger, you know European Union, as well as obviously the UK. I think to leave that EU would really take away that legacy. A final speaker in the art gallery, unnamed by the programme, saw things differently; he wanted resumed links with Commonwealth countries so more immigrants would start coming from those areas again. Will ethnic minority voters decide this referendum? Operation Black Vote said today a third of Britain’s 4 million or so BAME voters are not actually registered. Today the organisation released this controversial poster in an attempt to encourage them to do so. Because minority voters’ apparent support of Remain could prove decisive, but only if they turn out to vote. What was Razzall’s goal in this rather complex feature? How long she spent with the curry house owners in Sutton Coldfield is not clear. But what she included from her exchanges with them appeared to be aimed at establishing that the ‘out’ arguments about wanting immigration from the Commonwealth by curry houses and local businessmen were based on pettiness (the smell of curry) and self-interest so that they could find good chefs from their own background. In sharp and immediate contrast, the contribution she edited from her Sikh guest Davinda Bal – who wanted closer integration with the EU – was broader, more considered and less self-interested. She included his explanation that the issue facing immigrants was about ‘segregation and separation’ and his community ‘strongly believe in one world and one society’. In the art gallery, too, the motives of her interviewees were edited to show them to be less selfish, based on a realistic and enlightened desire for international co-operation and to ensure the equity of EU law to help the disadvantaged ethnic community. Razzall tacked on the end of the piece the perspective of the Operation Black Vote. Her exit point was that the ethnic community ‘s support for the EU could prove divisive, and that a ‘controversial’ poster had been released by the organisation. In fact, in many quarters, that poster was regarded to be hugely controversial, in portraying what looked like a white – skinhead-type – thug intimidating a gentle, sari-clad member of an ethnic minority. The motives of the Operation Black Vote organisation, funded by the immigration-supporting Esmee Fairbairn and Joseph Rowntree trusts, have been strongly called into question. Given that Razzall’s fulcrum appeared to be the significance of the ethnic vote in the EU referendum, it is hard to understand why she did not explore this further. It was a highly relevant news development. Overall, both Razzall and Robinson in their respective reports were in clear pre-emptive mode. Detailed analysis shows that this was not straightforward, balanced reporting. Their goal was rather to undermine claims by supporters of exit from the EU that an expected rise in immigration figures could threaten UK curry houses. On route, Razzall assembled a feature that undermined as narrowly selfish those Asians who wanted more Commonwealth immigration. She also chose to ignore an important controversy about the portrayal of the immigration debate. ‘REMAIN’ FAVOURITISM IN FIRST FORMAL BBC REFERENDUM SHOW?